We pride ourselves on an open and supportive relationship with travel agents, tour operators and dedicated travel and lifestyle concierge companies throughout the world. Why should travel agents work with AYPIOSS Yachts & Properties? We pride ourselves on an open and supportive relationship with travel agents, tour operators and dedicated travel and lifestyle concierge companies throughout the world. We are pleased to work with you in arranging your client´s vacation rental or yacht charters. We work hard to ensure that when working with us, not only your clients are satisfied, but you can do so with confidence and get attractive commissions on all bookings, while your clients remain yours now and in the future. Local concierge services and guests assistance during their stay. 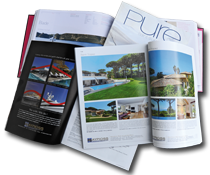 Regular newsletters about new properties and special offers. Just inquire by email about your client's destination wishes, dates, number of guests, budget and any relevant criteria, making sure to let us know you're a travel agent and to identify your clients' names so we know if they contact us themselves. Our villa specialist will come back to you shortly with a selection of available properties with broker friendly e-brochures, rates and your commission amount, answer to any questions and assist you throughout the booking process. Once your client is ready to book a property we will place an option for your client's date and provide you with a rental agreement and payment schedule. Once that is signed and the down payment received, we will confirm booking of the property for your clients' dates and will assist you in the preparation of your client's vacation by arranging any services needed for during their stay. Payments are usually made by wire transfer or credit card. Either the client will pay us directly for the rental and we will pay your commission to you directly, either the client will pay you and you will forward us the payment less your commission. Simply contact us on agents@aypioss.com and we will be in touch to answer all of your questions and assist you with your clients' enquiries.